Wed., Oct. 11, 2017, 3:15 p.m. In the fall garden, time seems to slow down as the plants and the gardeners both take a deep breath after the furiously fast summer season. The temperatures have cooled and plants are putting out new growth to take up the last of the fall sun before settling in for the winter. The colder air and early frosts have begun to color the ornamental grasses and tree leaves with tinges of orange, red, yellow and even purple. The asters and hardy mums are adding blazingly intense shades of purple, yellow and burnt orange. It’s so heady that one should just stop and soak it in. After all, in a few short weeks the garden will take on its mantle of snow and send us all scurrying into warm houses. 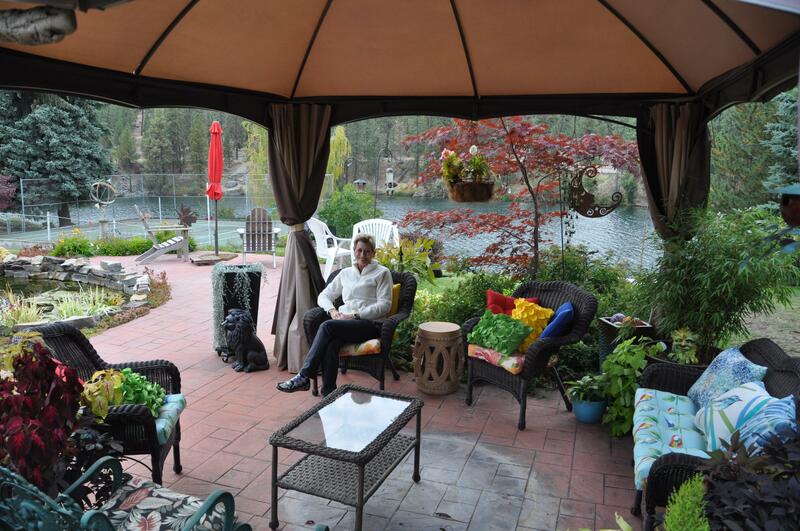 Sandy Mooney’s riverside garden near Upriver Dam, is the perfect place to soak up the last hurrah of the garden. She has used her artistic talent as a glass artist to blend together a beautiful collection of plants, pieces of unique garden art and architecture to create the perfect fall garden. Perfect enough to be awarded the September Garden of the Month prize from The Inland Empire Gardeners. Her front yard is boldly planted with clumps of brilliant purple, low-growing asters, yellow and burnt orange mums, bright red geraniums and clumps of ornamental grasses. The grasses are turning shades of yellow, orange and dusky purple that help cool off the hot colors of the other plants. Here and there Mooney has created some natural garden art by spray painting spent giant allium flower heads a bright blue. These punches of color seem to float over the garden beds adding a unique touch. In her backyard, she has created several terraces that step down from the back of the house and create several comfortable spaces to view the river. Published: Oct. 11, 2017, 3:15 p.m.